In May 2002 South African born Marianne Du Toit left Ireland, where she had been living for 11 years, for South America embarking on a two year journey which her family labelled as “madness”. With two horses, named Mise and Tusa, for company, she set off to discover America, riding from Argentina to New York. Du Toit based her trip on the journey of Aimé Tschiffely-hailed as the most famous long distance rider of the twentieth century- who rode the 10,000 miles from Buenos Aires to New York in 1925. She skimmed through his book about the journey as research but says she was “terrified to know too much”; afraid that if she knew how difficult the trip would be she may have decided she wasn’t up to it. With limited equestrian experience and even a slight fear of horses, her love of animals, eternal optimism and lust for adventure helped her persevere. “I remember since I was about 17 I would always read these articles about independent, daring women who had done these amazing journeys. There was always something deep down driving me to these adventurous things. I just loved the adrenaline and the excitement,” she says. Du Toit spoke no Spanish, could barely ride a horse, knew nothing about horse care or saddling up, and didn’t know a soul in the Americas. Horse owners in the United Arab Emirates each spend an average of 120,000 UAE Dirhams - that's $NZ42,358 or $US32,654, on equestrian gear, agistment and treatment per year, it has been revealed. The figure has been revealed in the lead-up to the International Equine Trade Fair, will open on November 29 at the Dubai International Convention and Exhibition Centre. About 200 companies from more than 20 countries will take part. A local 63-year-old cowboy will saddle up with his 18-year-old son to ride horseback through 11 states across America in June to honor wounded U.S. military veterans. Jef Keegan, a five-year resident of Lake Havasu City, said he anticipates beginning the trek in Virginia. The endurance ride should take him and his son about five months. The path they have chosen is the American Discovery Trail, the nation’s first coast-to-coast non-motorized trail, according to the ADT website www.discoverytrail.org. The trail’s terrain includes the Appalachian Mountains of West Virginia, the states of Ohio, Illinois, Illinois, Iowa, Nebraska, the Rocky Mountains of Colorado, the states of Utah and Nevada and ending in San Francisco. The Keegans will travel with about six horses and plan to camp each night along the trail. “Our horses are like part of the family,” Keegan said. LOCAL endurance rider Kirsty Wiscombe of Yawl has fought her way back to fitness after spending weeks in hospital last year to top the FEI worldwide rankings. Her homebred seven-year-old stallion Yawl Hillbilly has just finished in 5th place at the tough, hilly, 130km FEI 2 star Mirwart ride in the Belgium Ardennes near the Luxembourg border. ‘Billy has had a great season of international rides the longest being 161km in a day at Euston Park in Norfolk and these results mean that Kirsty and Billy have now qualified for next year’s European Championships in Florac, France and are the highest placed GB combination in 64th place. Thanksgiving is next week.... Turkey and Dressing, pies, Cranberry sauce, gravy, pies, sweet potatoes, green bean casserole, yummy rolls, pies, cookies, pies.... doesn't this make you hungry??? (I like pie...) Bring a covered dish to add to the fare. Come on out to the Hill Country State Natural Area at Bandera, Texas and join us for the Thanksgiving Dinner on Thursday evening from 4 to 6. Then ride the Lone Star I & II on Friday and Saturday; or ride one day and work the other. Our trail crew, Peter Ansorge, Paulette Brehob, Eron Howell and Caryne Edwards, assures us the trails are ready for the riders. We will have everything from some technical to some flat, easier trails so there should be something for everyone. When you arrive at The Hill Country State Natural Area, turn right across the low water crossing, following the AERC Ride signs, and continue to the Ranger Station. The Park is asking us to pay attention to the signs when you enter the Park this year. Drive through, but don't stop, in front of the Ranger Station. They are counting the rigs. When you reach the Lodge camping area, stop and you will be issued a parking permit and have your Coggins papers checked. The Lodge camping area is open for us from Thursday morning at 8 am. Please don't plan on arriving before then. If you come in Friday, drive carefully down the road, there will be riders on the road at times. We will have a manure station set up and marked clearly. Please bring a wheel barrow if you have one. The more the better. And don't worry about rain. We are dry, it never seems to get down here to us. It is not in our forecast for Bandera. The roads are good. If it did shower, it will be over quickly. Trails are in good shape and will be well marked. The AERC National Championship Committee is pleased to announce that the 2011 AERC National Championship is going to be held at Fort Stanton, New Mexico. Proposed dates are August 25-28, 2011. Ride managers will be Roger and Sue Taylor, famed for their Fort Stanton Multi-day ride held yearly in July. We are excited to showcase Fort Stanton and AERC's ongoing partnership with the Bureau of Land Management (BLM). More information will be passed on when available. We left Hayward, CA. on March 1st, 2010 to trailer Sojourner down to Los Angeles, CA where we would start what would turn out to be a 3,700 mile ride to Bath, New Hampshire. Two days ago on November 14th at around 4:30pm, eight months and 14 days later, Sojourner, Walter and I stood at the end of the long driveway that led to my childhood home. I slipped down from the saddle and put my face close to Sojourner who was looking down the driveway. "This is my home, Soj. This is where we've been riding to all this time. Thank you, my sweet boy, thank you so much...."
With so many different equine supplements and feed choices on the market today, it can be hard to know what to feed your horse to help ensure that he competes at the top of his game. Dr. Kathleen Crandell, a nutritionist for Kentucky Equine Research, explains the 10 key concepts for feeding the performance horse in a free one-hour Webinar, which will be held on Nov. 23, 2010, at 1 p.m. (EST). During the Webinar, Dr. Crandell will answer your questions about feeding your horse. 1. Finding the right combination of energy sources. 2. Getting the right amount of energy. 3. Feeding for proper absorption of nutrients. 4. Keeping the digestive tract happy. 5. Getting the right amount of protein. 7. Getting everything needed into the easy keeper. 8. Feeding the right kind of fat. A Webinar is an online seminar that you can attend from anywhere with Internet access (we recommend you have high-speed internet). During the webinar, you will be able to send Dr. Crandell questions that she will answer live. The Webinar is geared toward performance horse owners and equine professionals, but everyone is encouraged to attend. Dr. Kathleen Crandell received an M.S. in equine nutrition and exercise physiology from Virginia Tech under the direction of Dr. Tom Meacham and a Ph.D. in equine nutrition and reproduction under the direction of Dr. David Kronfeld. Her Masters research focused on the effects of added dietary fat in exercising growing horses and her Ph.D. work was in vitamin A depletion and supplementation in broodmares and growing horses. Dr. Crandell spent two years on the faculty of Virginia Tech as the Superintendent of the Middleburg Agricultural Research and Extension Center in Middleburg, Virginia. Before pursuing her degrees, Dr. Crandell spent several years abroad and is multilingual. As one of KER's technical staff members, Dr. Crandell provides support for KER Team Members and their customers through formulation, product development, and technical field service. The Webinar is free, but attendance is limited. To reserve your spot, please go to http://www.ker.com/news/2010/11/live-webinar-10-key-concepts-f.html to fill out the form. Most of our articles are written on ride results and the competing portion of this sport. Well, I’m going to write about what it takes to become a true endurance rider. To some, endurance is all about the win, but to others it is a gathering of old friends and a great place to meet new ones. Not only do we consider each other as close friends, but family as well. An endurance family. We all get a kick out of each others stories of getting to the ride such as: “Yeah, I blew four trailer tires on the way here,” or “It took me an hour to catch my horse, sorry I’m late!” or the classic, “Wow! That’s a four beer road! I should get a completion for just getting here!” We give each other support, help and knowledge that isn’t easily forgotten. It all starts with pulling into the ride, setting up and being greeted by our friends. For some of us, setting up is more of a challenge than it is for others. When it comes to parking, some people put a lot of effort into levelling their trailer while others don’t care if they park on a hill. Fencing comes next — from simple panels to tangled hot wire, or even just tying to the trailer. Next, we go register, which usually results in a long conversation about marking trail with the ride manager. Endurance GB, the governing body of endurance riding in the UK, has embraced the social network site, Twitter, to keep its members up-to-date with the very latest news and action. The crew began tweeting at the World Equestrian Games (25 September-10 October) when they posted information more than 70 times, including 50 tweets during the 129km ride. With detailed and instant coverage, followers were kept abreast of the action as it unfolded. Endurance GB plans to continue using Twitter as a way to communicate with its members and fans. Connie Jarzmik, 58, of Ballantyne has found a community of fellow riders and friends at the Lynnwood Equestrian Center just over the border in Fort Mill. The barn boards 35 horses, and the 21 owners mainly are women age 30 to 65. Jarzmik rides with this group of women both locally and internationally. The riders take their horses on the nearly two hours worth of trails on the center's property, and they have access to an additional 500 acres. The riders also take day trips to the mountains, beaches and parks, including Boone, Blowing Rock, Asheville in North Carolina and Myrtle Beach, Springs Park and King Creek in South Carolina. Two years ago, 10 of the riders traveled to Barcelona to ride Spain's Andalusian horses. "We rode 25 miles a day for six days," said Jarzmik. 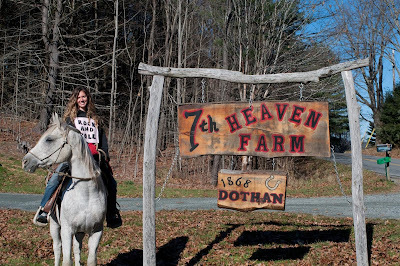 "We made camp for the horses and we stayed at little bed and breakfasts and a variety of places overnight...."
For Sophia Mangalee, life's adventures are best made on the back of a horse. And the adventure of a lifetime seems to be just around the corner. Come next Aug. 6, Mangalee will learn whether or not her preparations have paid off, when she embarks on the longest horse race in the world … the Mongol Derby.